God, Charlton and Punk Rock: Bringing the roof down. Amazing to think this could actually happen, but it did. By the grace of God it didn't happen during an actual football match, we've had enough of those disasters over the years, yet one death is one too many. 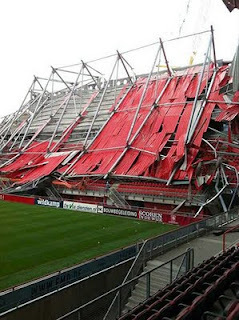 This is the scene at the ground of Dutch club FC Twente, former employers of Steve McClaren. With rebuilding and stadium improvement work ongoing, the capacity of their De Grolsch Veste ground is on the increase from an original 13,500 to a proposed 32,000. The roof literally came crashing down on them today when two large supporting beams buckled, killing one and injuring fourteen others. I've been to so many football grounds over the years without any concern for my own safety. Well perhaps being a little wary of which pubs to frequent on away trips being my only sensible consideration. Never though have i thought of any possibility of major disasters happening that change peoples lives. I know it does happens, and i have the deepest sympathy for survivors and family of those affected by Hillsborough, the Bradford fire, the Heysel stadium, Ibrox and all other sporting tragedies. You just never think it could happen to you. I can't for one minute imagine this design of roof has never been used before and structurally was designed for this one project alone. It is however a one off occurrence which would have been a lot lot worse if the season had already started. My thoughts and prayers go out to the club and all it's supporters. Fans who now must be wondering what will happen to their season and where their side will be playing. It makes our own news back in SE7 appear very unimportant. Big Joe has signed for Bristol Rovers, AFC Bournemouth want to buy Simon Francis, Miguel Llera has found a club and today our player of the year Jose Semedo has signed for Sheffield Wednesday. Good luck to all of them. I feel Big Joe Anyinsah will get the least abuse. Well loved at Charlton albeit hampered by injuries, good luck messages have been pouring in to the front man. Simon Francis can't get more verbal anywhere surely than he has in his time with The Addicks. It's been a while since anybody has come in for so criticism as the full back has this season. A shame in my eyes as i don't think for one instance the lad hasn't stepped out onto the park without trying to give it his best shot. Every club needs a scapegoat though when times are tough. Jose Semedo will, i fear, go from hero to villain. After such a dedicated job, first as defender then as midfielder, for the club, a move to another League One side won't send the best of messages out to the Covered End. I hope I'm wrong, Jose was out of contract and would have made a career move to the advantage of his family in the long run. Wanting to see his playing days out in Charlton may have been an honest remark in May, but two months is a long time in football. And Llera? We wait with baited breath to see where he's ended up. Rumour has it we'll all be a little surprised! As for all this talk of Sol Campbell coming our way..................................behave!